Looking for health or science related images? The National Institutes of Health (NIH) recently launched the NIH Image Gallery on Flickr. 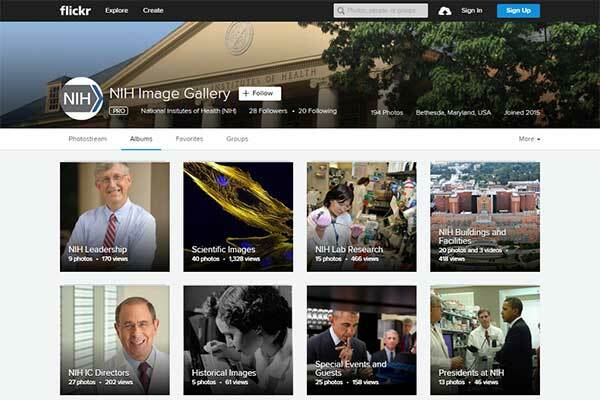 The Image Gallery offers a wide variety of scientific, biomedical and disease related imagery as well as photos of NIH leadership, labs, buildings and major historical events. Additionally, you can find NIH infographics, b-roll, and the latest research images. The Flickr site was developed as a means to distribute images to the press and public while ensuring proper license, permissions and copyright protections are documented. The majority of the images offered are free to reuse with proper credit given. The content in the NIH Flickr site will be continuously updated. View the gallery on Flickr and follow the NIH Image Gallery to stay connected. Please note, if you cannot find the image you are looking for, you may email us a request. You can also find more information on the NIH Image Gallery.